Differentials Rebuilt, New, Used and Exchange. All Differential makes and models available. Available for local delivery or shipped World wide. Differentials from: Spicer Differentials, Eaton Differentials, Rockwell Differentials, Meritor Differentials, Mack Differentials, Dana Differentials, Fabco Differentials, Marmon Herrington Differentials, International Differentials, Volvo Differentials, Ford Differentials, Sterling Differentials, GM Differentials, Dodge Differentials, Jeep Differentials, Isuzu Differentials, Oshkosh Differentials, FWD Differentials, Timken Differentials, Clark Differentials, and more. 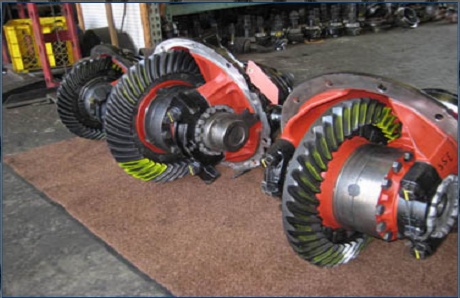 Parts, service and repair for any model differential ever built. Our inventory of truck differentials is one of the largest in the World. Same day World wide International shipping. We stock hundreds of new and used differentials as well as fully rebuilt differentials. We offer a complete line of new, fully inspected used and rebuilt truck differentials. We can locate any differential part part ever built and do it today. Fair, honest and straight forward. We want to earn and keep your business.